Panerai’s original ‘Bronzo’ (the PAM00382) of 2011 had been assumed at the time, to be a one-off. Not only was it not, but it was also instrumental in the subsequent widespread popularity of this material. What had seemed to be a mini-trend has turned into a more long term one, with each year bringing new brands into the bronze fold. In 2013 came their second bronze model, the PAM00507 Luminor Submersible 1950 3 Days Power Reserve Automatic Bronzo, also in a limited edition of 1,000 pieces. Then in 2017, Panerai released the PAM00671, a 47mm Luminor Submersible 1950 3 Days Automatic Bronzo with a blue dial (currently listed on their website at 14,200 CHF incl. sales tax). 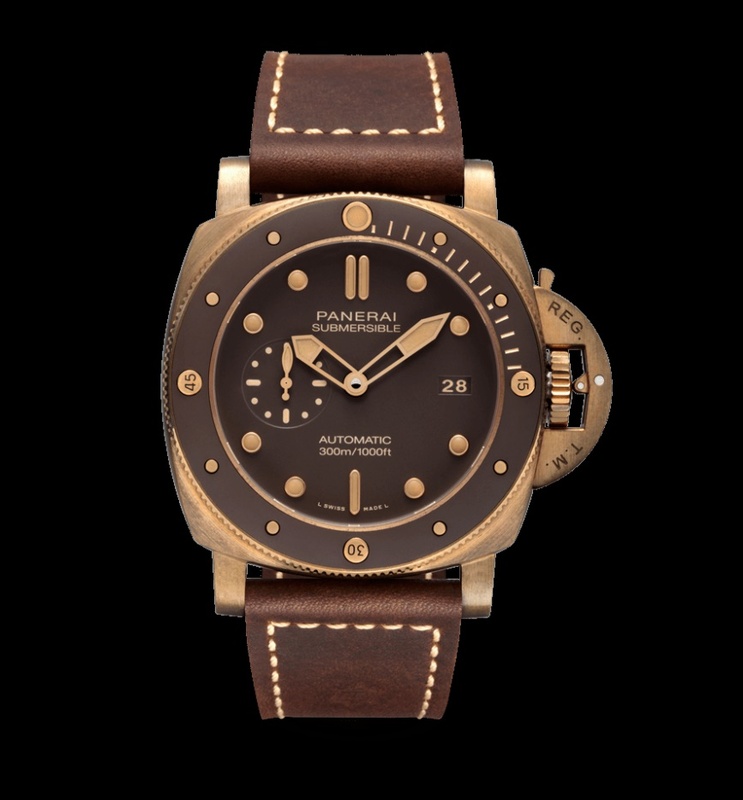 There was also a pièce unique, the PAM907 Luminor Submersible 1950 3 Days Automatic Bronzo Brown, that was created for the Panerai Experience Online, an auction whose proceeds went to the Royal Yachting Association to support their sailing programme ONBOARD. With the brand having played such a pivotal role in this, it seems only fitting that we include their latest Bronzo in this fortnight’s thematic focus. The new Submersible Bronzo PAM00968 is most notably distinguished from its forebears by being the first Bronzo to feature a ceramic bezel in its 47mm case. The micro-sandblasted ceramic is brown, matching the dial’s colour. There is a date window at 3 o’clock, sub seconds at 9 o’clock, and the hour markers and dots are lumed. Inside is the automatic Calibre P.9010, beating at 28,800VPH and with a power reserve of three days. Although it comes on a matching brown leather strap there is also another Bronzo ‘first’, an olive green rubber strap for diving. For those who wish to dive, water resistance is 300m. The RRP for the PAM000968 is 16,200 CHF (including tax).